In stock - low quantity. Order in the next 10 hours, 3 minutes and it will go out today! 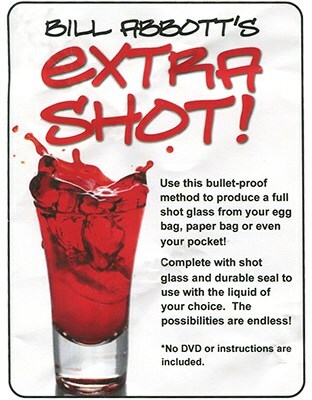 Use this bullet-proof method t produce a full shot glass from your egg bag, paper bag or even your pocket! Complete with shot glass, and a durable seal to use with the liquid of your choice. The possibilities are endless! *No DVD or Instructions are included.